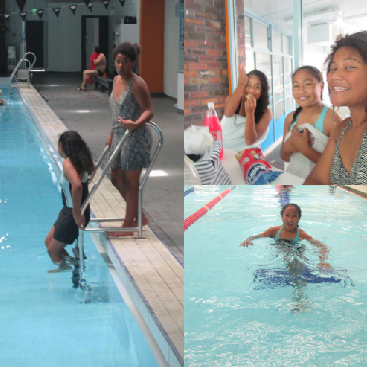 Hannah @ Pt England School: Going Pool's With My Friends! On a bright sunny day, my friends and I went to the pools. At first me and Josephine planned it to be me, her and her cousin. But her cousin didn't come, so we picked up Iron. As soon as Josephine and I knocked on Iron's door, all we heard were foot steps coming down the stairs. Then we hid behind a white wall. When she opened the door Josephine and I jumped out from the white wall and shouted "HI!" As we said that she got a big fright and then she asked "what are you doing here?" We said "to pick you up!" Then we asked her if she was allowed to come to the pools. As soon as we asked her she quickly said yes. Then headed straight to the door. As we got to the pool's, we quickly got changed and ran straight to the pool. When Iron went in the pool she said it was really really cold. So in my head I was thinking of not going in, but then I just jumped inside. I wasn't shivering like Iron because I got use to it. My favourite part was seeing my friends. Can't wait to see you guys again!